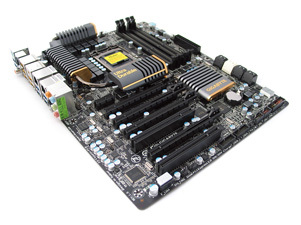 DiGiTaL MoNkEY has taken a look at Gigabyte's P67A-UD7 Motherboard. It features eight SATA ports (four SATA 3.0, four SATA 2.0) with RAID 0, 1, 5 and 10 support, a 24 power phase design, four DDR3 memory slots with support for XMP profiles and speeds up to 2133MHz, ten SuperSpeed USB 3.0 ports (six rear, four front), GIGABYTE DualBIOS technology and dual Realtek Gigabit LAN connectivity. It also has three PCI-Express 2.0 x16/x8 slots, allowing for true 3-way CrossFireX and SLI configurations, all while conforming to an ATX Form Factor measuring in at 30.5cm x 24.4cm.